Two Border Security Force jawans were among four persons injured when Pakistani troops violated the ceasefire for the third time in less than 48 hours by firing with small arms, automatic weapons and mortar shells on 10 border out posts and civilian areas along the International Border in Jammu district. "Pakistani Rangers resorted to unprovoked firing from small arms and automatic weapons on border out posts and civilian areas along the IB in Arnia sub-sector in Jammu district from around 2030 hours late on Sunday night," a BSF officer said in Jammu on Monday. 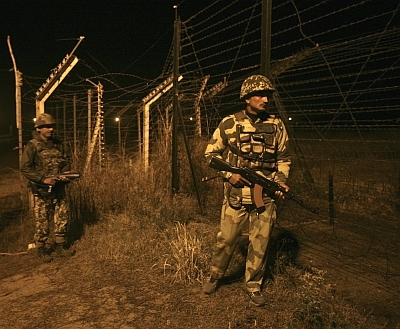 BSF troops guarding the borderline along the International Border took positions and retaliated to the Pakistani firing which resulted in intermittent exchanges of fire, he said. Two BSF jawans suffered minor injuries in the firing exchanges, the officer said, adding the exchanges continued till 0600 hours on Monday morning. The injured jawans have been identified as Head Constable Sumit and Constable Vaishnov Dutt. Two civilians identified as 43-year-old Rani Devi and 22-year-old Raishu of village Sahaug in Arnia were also injured in the firing , the officer said, adding the injured have been hospitalised. Pakistani Rangers resorted to sniper firing in Nikowal and Bhudwar BoPs in Arnia belt and then fired at Tent Guard post around 2030 hours last night. Later, they opened fire on Pittal, Pindi Charkan, Kake-de-Kothe, Chinaz, Nowa Pind and Jogna Chak BoPs. Pakistani troops also fired dozens of mortar shells in Kodwal, Pindi, Sahugh villages before dawn and the firing ended around 0700 hours on Monday. Four structures suffered damages in the firing including two in Kodwal, a banquet hall and a boundary wall of a house in Pindi, a police officer said. This is the third ceasefire violation in less than 48 hours and the first along IB after an agreement to observe peace along the border between BSF and Pak Rangers at the commandant level flag meeting at Octerio BoP in R S Pura belt of Jammu district on August 8 during which one captured jawan was handed over to BSF by Pak Rangers. The fresh ceasefire violation comes ahead of the visit of Prime Minister Narendra Modi to Ladakh region's Leh and Kargil districts on Tuesday, where he is going to inaugurate power projects and address troops in Leh. On Sunday, Pakistani troops had violated the ceasefire by targeting Indian forward posts with small arms and automatic weapons along the Line of Control in Mendhar sector of Poonch district. On August 8, Pakistani troops had violated ceasefire by resorting to firing on Indian Posts along LoC in Bhimbher Gali sector of Poonch district. On August 5, Pakistani troops targeted Indian forward posts with small arms and automatic weapons along the Line of Control in Sher Shakti forward belt of Poonch district.